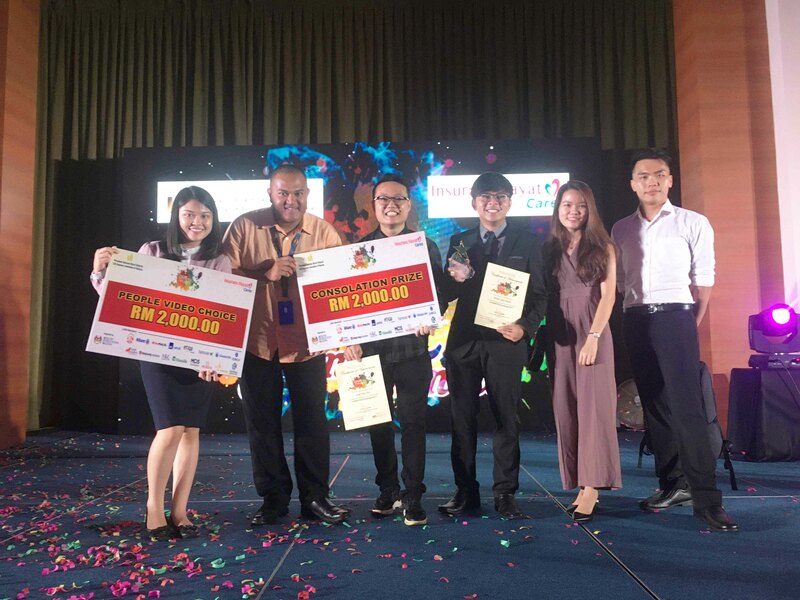 Faculty of Arts and Social Science (FAS) Advertising alumni Wong Jian Xiang, Tan Chee Kiang and Chai Yao Hui beamed with joy as they swept the Consolation Prize and also the People’s Choice Video Award in the #IDAREYOUChallenge Grand Finale held at Kuala Lumpur on 3 September 2018. An innovative youth engagement programme organised by the Life Insurance Association of Malaysia (LIAM), I DARE YOU Challenge (IDYC) is a platform to create awareness on the importance of financial planning and protection among the young generations. Kicked off in September 2017, participants had to first write a synopsis on their actions to feel financially secure and record a video in the most creative way. The Top 30 teams were then selected to attend a boot camp in which they were required to devise a marketing plan and then prepare a video as a marketing tool based on one of the topics released during the boot camp. Mentored by FAS lecturer Mohd Yusof bin Zulkefli, the trio, known as UTAR Stormers, subsequently advanced as Top 10 finalists along with participants from Universiti Malaya, Asia Pacific University and IACT College. The Grand Finale also saw the Top 10 finalists pitching their creative business plans and videos to the life insurance industry which then sealed the fate of their victory. Thankful for winning the Consolation Prize which came with a cash prize of RM2,000, Wong also said the experience has been rewarding and invaluable. “I’ve always wanted to challenge myself to see how I will fare in marketing concept planning, presentation and video production. Being one of the winners makes me feel proud and glad. We have come a long way by competing with other outstanding teams which came from institutions of higher learning all over Malaysia,” said the team leader of UTAR Stormers. Echoing Wong’s sentiment was Chai who also mentioned that their team’s dedication was the key in getting them this far in the competition. “We have always had great faith and trust in the team. I’m very proud of everyone for spending their personal time on this project and yet still able to manage their studies. This competition is a great ending to our university life in UTAR and it’s been an honour to represent the University,” he added. 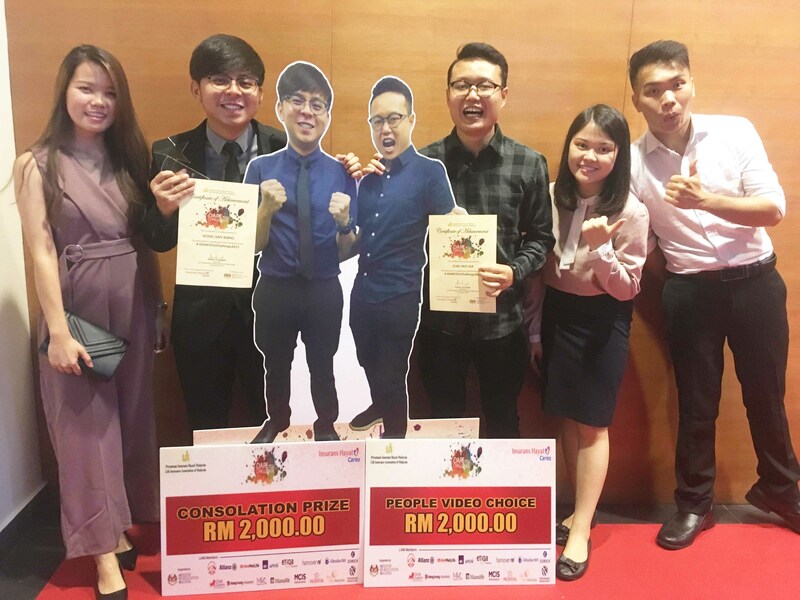 Besides being a consolation prize winner, the trio also walked away with a cash prize of RM2,000 and a trophy for winning the People’s Choice Video Award. “I believe our video won the people’s heart because we injected humour into the storyline to make it not only entertaining but also relatable,” explained Wong. Produced and directed by Chai and Tan, the video received the highest number of likes and share on Facebook. The trio also expressed their heartfelt appreciation to the video’s First Assistant Director Cheah Mei Foong, Production assistants Chin Rui Shee and Wency Ho, as well as actors and actresses who were involved in making the video a hit among viewers. Also thanking their advisor Yusof, the trio mentioned the FAS Public Relations lecturer played an essential role in guiding and motivating them, even when the challenges get tougher along the way up until the Grand Finale. “It was certainly an honour to be the advisor to the UTAR Stormers team and I thank them for their trust in me. To me, it was an opportunity to showcase the creative side of our students and to put UTAR under the spotlight,” professed Yusof. He also rejoiced over the fact that similar to the UTAR Stormers, there are plenty of multi-talented UTARians out there who aim to excel in many things and also able to apply what they have learnt from classes quickly. The competition is supported by the Ministry of Education.